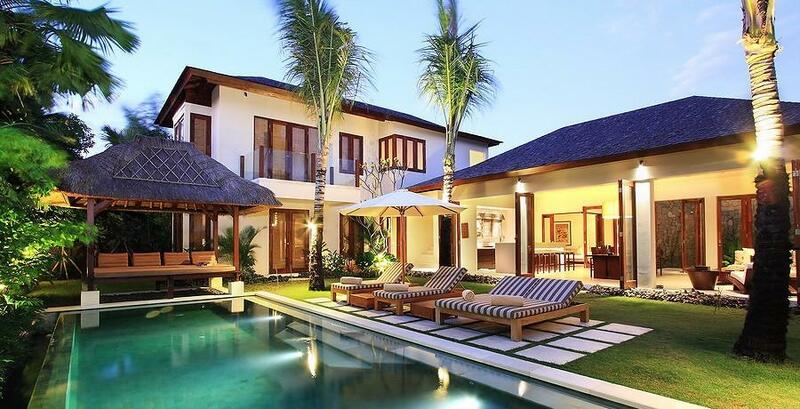 Villa 3114 is a lovely contempory, tropical, 5 bedroom villa accented with a refreshing white decor. 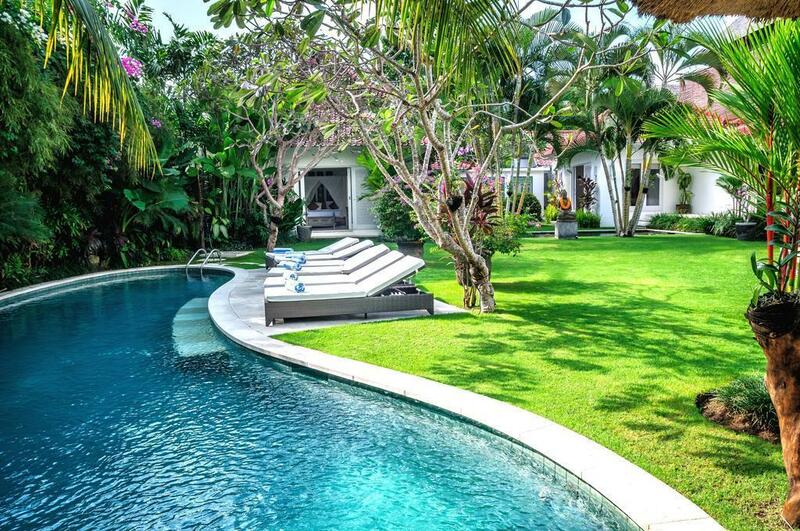 Located in Seminyak the very heart of the upmarket neighbourhood of the exclusive Sentosa the villa is ideally positioned for those seeking all the benefits of being walking distance to the best of Bali's sunset beaches and classiest restaurants and nightspots. 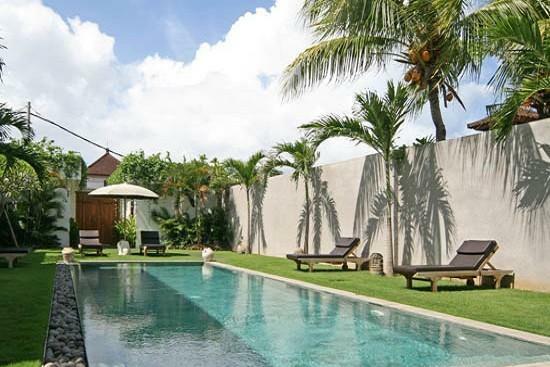 Villa 3114 is set securely within a high walled 15 Are of private garden studded with two swimming pools. 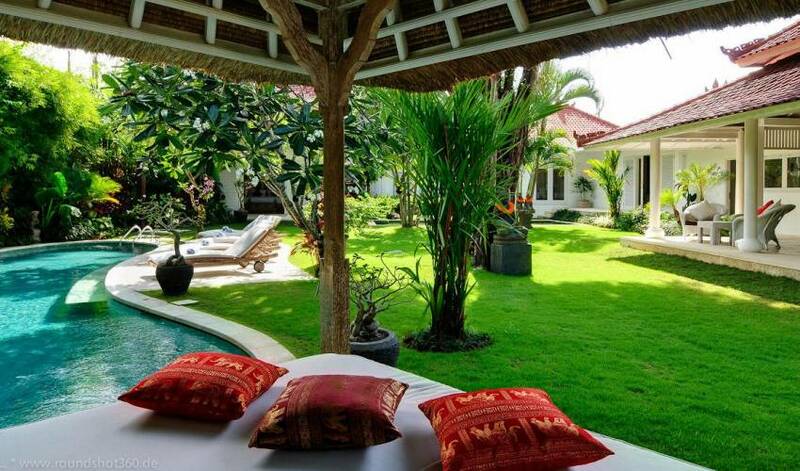 Villa 3114's atmosphere is one of serene privacy and luxury made complete with the welcoming hospitality of the household's trained gracious Balinese staff. Importantly, the house truly feels like a home, every room features old Bali and Javanese framed prints, collected antique batiks and decorative timber pieces and selected books, music, films and a variety of family board games. 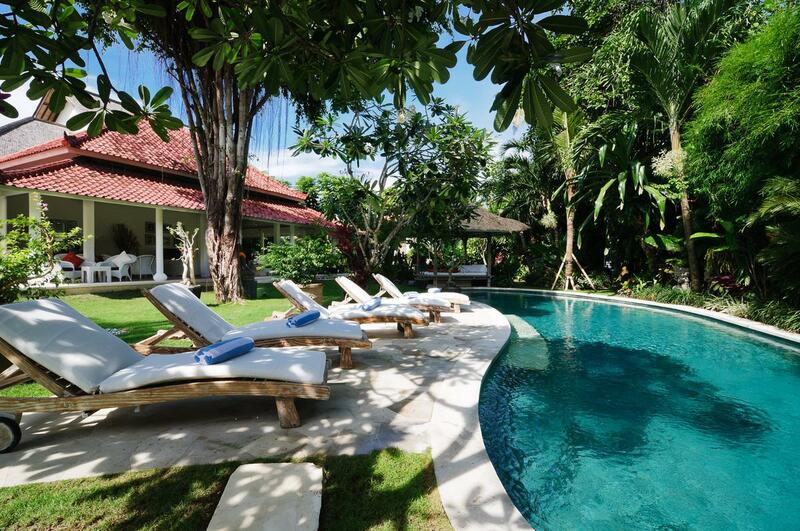 Villa's Villa 3114 choice location and elegant simplicity is an ideal holiday villa for family and friends alike. The villa has surround wi-fi, so you can stay connected throughout your stay. 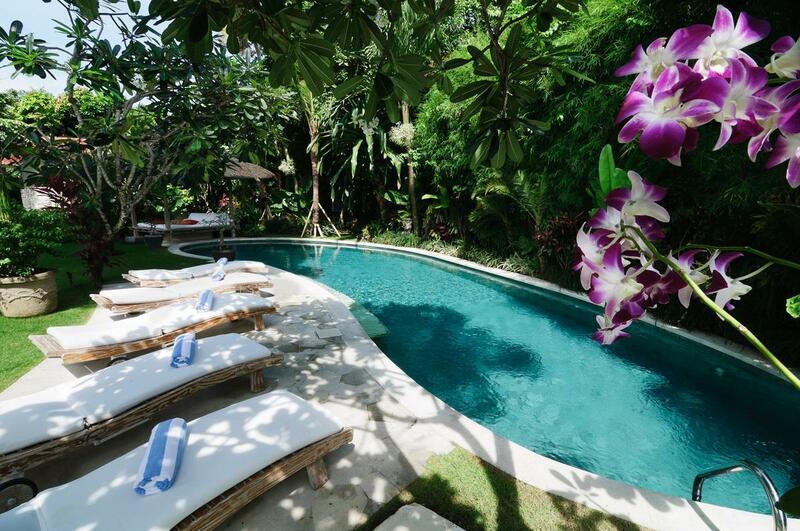 Villa 3114 is located in Seminyak on Bali's south - western coastline. 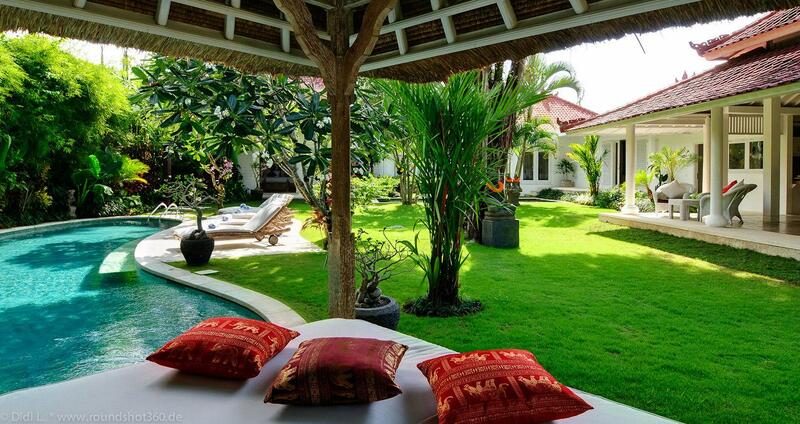 The villa is less than a 5 minute walk to the Seminyak beach, and the famous La Luciola, Living Room, Hu ‘u',Day dream and Kudeta, restaurants are just down the road. Metis and Sardine the ever expanding selection of glamorous restaurants, chic night clubs and fashionable spas and boutiques in Jalan Oberoi are only a few minutes drive away. The drive from the bali's international airport takes approximately 25 minutes. The villa is also convenient to all of the many of Bali's tourist attractions with Kuta and the Waterbom park less than a 15 minutes drive. 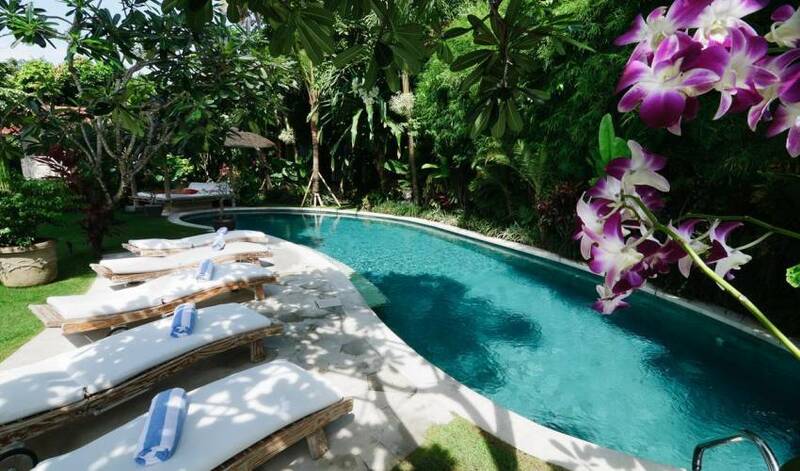 For the sporting enthusiast most amenities are equally accessible including the ‘Canggu Club' tennis and gymnasium facilities, the Umulas horseback riding school and surf schools. The spectacular Le Meridian championship golf course at Tanah Lot, is only 20 minutes by car. 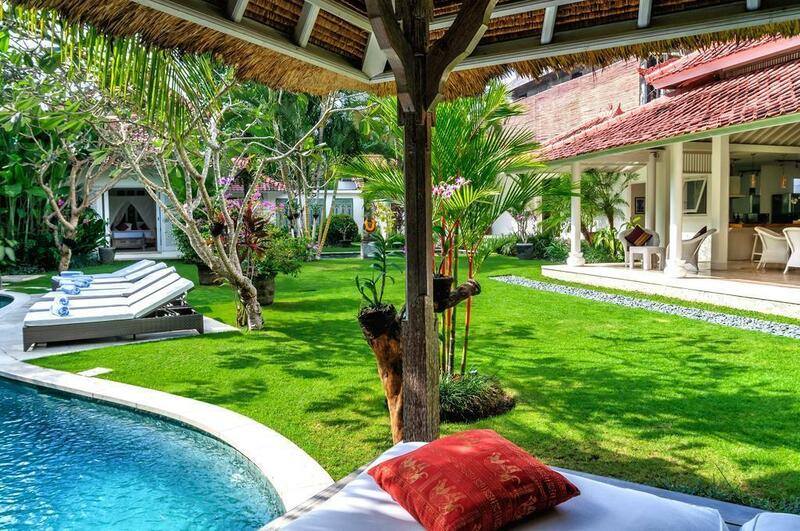 Villa 3114 has been entirely refurbished by the locally-acclaimed, Bali-based, PT Triadi architectural and construction group, the villa accents colonial style elements, such as high ceilings, cool limed terracotta tiled flooring and large terraces graced by tall white pillars. 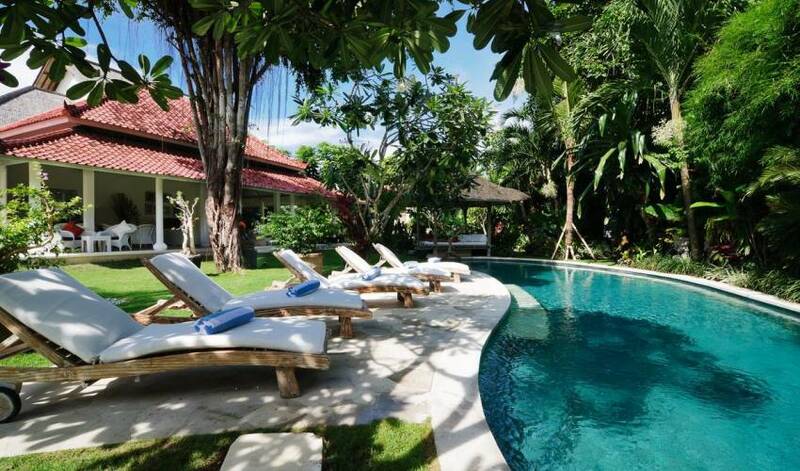 As is their standard, the villa has been built with the very best of amenities and to the highest standards. The proportions of all of the living areas and bedrooms are generous, and the interior furnishings have been tastefully integrated throughout, with comfortable white over sized rattan armchairs, and lounges. 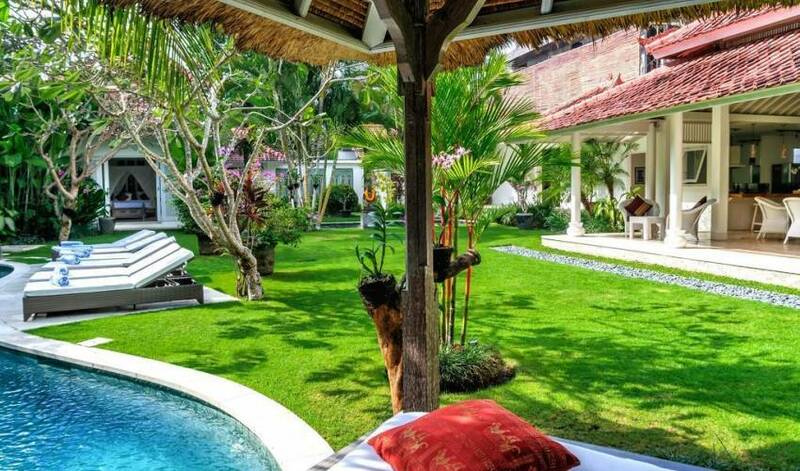 The villa owners have lived in Bali for over 12 years and their very personal sense of style and appreciation of the various Indonesian materials and local crafts are tastefully reflected throughout the villa. 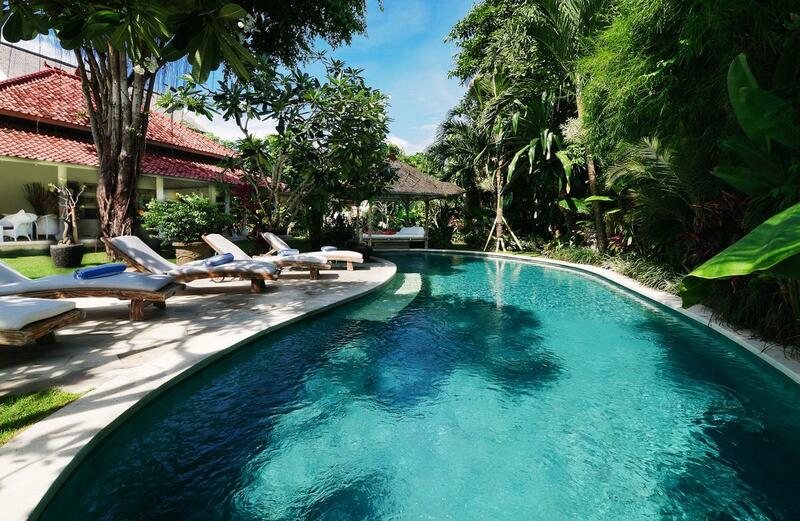 The villa is accessed by the private Sentosa Villa driveway, with secure parking for 4 cars. Guests enter through a set of traditional double Balinese doors opening onto a Aling Aling wall behind which is a small fish pond with a Barong face water feature. The garden is simple and easy on the eye, edged with several rare and mature massive Hawaiian palm trees. One pool opposite the living area is kidney shaped and has 6 pool deck chairs and a cushioned Pool Bale. The second smaller rectangle pool divides the living Pavilion from the master bedroom pavilion. Fortunately the villa has a completely separate access for the staff and all service deliveries, so you are not disturbed or interrupted unnecessarily during your stay. 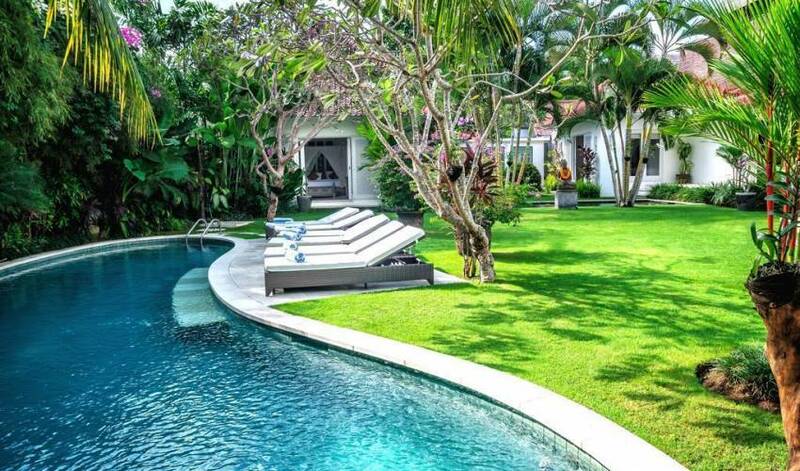 Large white palimanan pavers walk you immediately to the central focus of the villa - the magnificent and expansive 12 m x 10 m open-air living and dining pavilion which opens directly onto the flat lawn garden and main pool deck, giving a seamless flow from indoors to out. This pavilion has spectacular high wooden white painted ceilings, set with overhead fans and the wide roof overhang and large terraces ensure that guests can enjoy all the benefits of open tropical living and can still be protected from the elements. This open planed area accommodates two 5-seater oversized rattan sofas, and a TV area. Two further casual seating areas with large white raffles style rattan chairs face onto the garden. A beautiful timber dining table easily seats 14 guests. At the rear a stunning natural 4 meter timber bar opens to a beautiful galley guest kitchen. Unlike many villas in Bali, where the kitchen is tucked away at the back of the property, the immaculate open kitchen at Villa 3114 is a popular with guests who enjoy mixing drinks and preparing some of their meals if that is to their liking. The kitchen has large mirrored back walls, soft grey marble work surfaces and white cupboards and is fully equipped with refrigerator, and gas hob. A separate service kitchen is located adjacent to the rear of the open guest kitchen. This kitchen has been set up so that the staff can prepare food separately and serve it elegantly for all guest dining. This kitchen is also fully equipped with a second stove and fridge and has everything else that the staff will need to create delicious meals. There is also a large canopied BBQ. Villa 3114 is ideal for entertaining for both small and large formal dinners. Dimmed over head lighting, together with the atmosphere of a beautiful set, candlelit table, overlooking the garden and pools make for many a memorable evening. Dinners are cooked by our excellent cook Ketut, who shops at the local markets, and is served by our well trained staff. Villa 3114 is close to many local markets and shops and fortunately to Bali Deli which has the best selection of imported foods and wines in Bali. A menu is provided and you can always discuss your particular menu and food preferences. Bali now has many specialist caterers who can arrange all aspects of catering from food, wines, and decorative details including flowers, additional sound and lighting systems and entertainment to create a unique in house experience. The Balinese are very proud of their heritage and special Balinese entertainment, with their unique dancers, and gamelan band can also be provided. From the main living pavilion a wide white palimanan terrace takes you though to the bedroom courtyard which is U shaped. The two bedroom pavilions are separated by a feature wall of three antiqued limed Bali doors that are beautifully unlighted at night.. 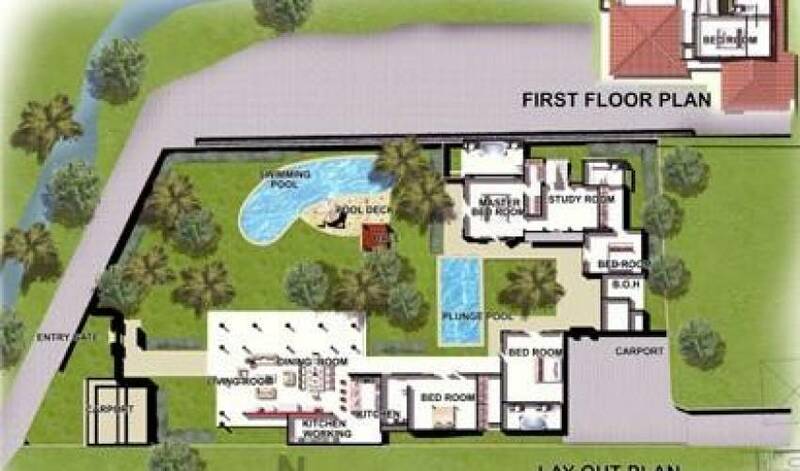 There are 4 bedrooms downstairs and one upstairs. All the downstairs bedrooms wide double doors which open onto the courtyard. As one would expect from any discerning villa all bedrooms are air-conditioned, with overhead ceiling fans and all have an en-suite bathroom. Four bedrooms have large super king 200 x 200 sized beds, one bedroom has large twin beds, which can be put together to as a Queen sized bed. A dreamy night sleep is assured with lightweight duvets, 100% cotton sheets and soft cotton mosquito net canopies. White curtains are drawn at night ensure that the bedrooms are kept cool. Three bedrooms have large walk in robes and two have wardrobes, all with safety deposit boxes and plenty of storage space for luggage. The bedrooms have been simply decorated with individual colour themes but have been tastefully integrated to have the same soft rose-tinted terracotta edged in timber floors and continue the cool white theme of crisp white walls, white rattan easy chair sand white linens. Both master bedrooms have twin, his and her vanities, bathtubs and the popular outdoor shower. The main master has a stunning adjoining large cream large terrazzo bathroom entered via large antique limed timber doors. The bathroom has a central bathtub large enough for two with a beautiful tropical garden carved stone wall feature. The outdoor shower is behind glazed walls with a bamboo detail. The bedroom closest to the living pavilion has an internal shower only as does the bedroom upstairs. The twin bedroom has a shower only with a delightful courtyard garden. The media room has been cleverly designed to give access and easily connect the three bedrooms in the separate master bedroom pavillion. This is an ideal set up for families. The master bedroom has an internal door which opens onto the media/study room. The media room also is the access to the bedroom upstairs, with the twin bedroom only a few steps away. The TV Room has a wall unit with, cable TV and DVD player, a wall to wall built in sofa, a cozy nook for relaxing. There is an on-site laundry and the staff has been trained to handle all guest laundry. Please advise which items you wished to have dry cleaned, which will be arranged for you and charged at local prices. STAFF There are 9 full time staff at the villa to take care of your every need. All the house staff speak English and have been carefully trained to accommodated the needs of a fully working household with guests. The staff are also available to run errands, arrange to call in house masseurs to visit the house and book restaurants and the like.